The M-4160-50R8PD2 trayless storage server rackmounts not only have a compact size, but the trayless and hot-swappable 3.5" bays make this chassis a new breed of storage servers. The chassis has four SFF-8087 connectors on the backplane to support the latest SAS and SATA hard drives and also is compatible with ATX and mini redundant power supplies. With a 500W redundant power supply, M-4160-50R8PD2 provides server or cluster maximum reliability and performance with zero down time. 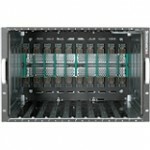 The M series chassis are available in 1U, 2U, 3U, and 4U form factors.